It’s your special day and you want to make a splash. How can you arrive done up to the nines in your old banger? Hiring a car is the perfect option, but why not go one better and hire a stretch limousine! Whatever your special occasion, here at Limos North West it’s our job to make it the most glamorous, stylish event you’ve ever had. At least as far as the travel is concerned. Our range of cars, including Chrysler, Lincoln and Ford models, offer a stunning range of luxurious features to make your day go off a treat. We can seat anything from eight to sixteen passengers in sumptuous surroundings, with air-conditioning, full-length bars and stargazer ceilings. So sit back with a bottle of iced bubbly and crystal glasses, and watch the world go by as you glide effortlessly to your event. We cater for every occasion. Naturally, weddings are the most popular, but there are so many good reasons to hire a limo. Hen parties, race days, retirement parties we have a car and a package for all of them. Maybe you just want to make the school run extra-special because it’s Tuesday and it’s raining? Book a stretch limo. 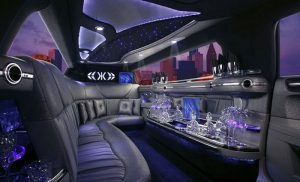 Born to Rock – make it a ‘limo-style’ night out! We’ll do what it takes to make the day special. If it’s an event for the kids, we can provide non-alcoholic fizz and our fully CRB checked drivers will ensure it all goes off without a worry. Oh, and if you fancy a sing-along on the way, try our party bus with its touch-screen Karaoke system and get that wild night started on the right foot! The possibilities are endless! So get in touch with your inner celeb and book a stylish set of wheels from Limos North West. Make that splash!